Today the Republican led Congress voted to hold Attorney General Eric Holder in contempt of Congress for allegedly withholding requested documents related to the clandestine Fast and Furious gun walking program. The events that led to this vote are complex and convoluted, partly because of the secretive nature of this operation that may have caused the death of an ATF agent. The facts regarding the death of the ATF agent Brian Terry, supposedly by one of the guns that were surreptitiously sold to the Sinaloa Mexican drug cartel by the ATF are quite dubious. In 2006, under the Bush administration, an operation was set up to intentionally sell guns to the cartel, in hopes of tracking the weapons and connecting them to the cartel. The ATF entered the serial numbers of the guns into a database called eTrace which allows the electronic exchange of traced firearm data in a secure internet-based environment with Mexican and other international law enforcement officials. The ATF discovered in December 2010 that Agent Brian Terry while patrolling the Arizona border had been killed by one of the guns that was sold to the cartel. The Fast and Furious gun walking operation did not receive public scrutiny until after the death of the ATF agent, however, once this information was made public it was discovered that the Bush administration had operated 2 other gun walking programs into Mexico dating back to 2005. 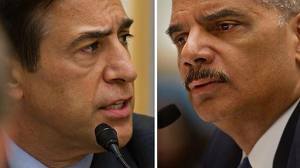 The Congressional Investigative Committee led by Republican Darrell Issa received over 7000 subpoenaed documents from AG Eric Holder, but continued to press for additional documents in an effort to needle the Attorney General and hold him personally accountable for a program that was started under the previous Republican administration. In response, President Obama claimed executive privilege in an effort to thwart the investigation and prevent private executive communications from becoming public or becoming available to a politically motivated Congress. This Republican Congressional vote of contempt and the Fast and Furious investigation is simply a divisive attack against President Obama’s chosen Attorney General. Republicans such as Issa and NRA congress members have recently been making ludicrous claims that the Fast and Furious program was somehow a deliberate attempt by the Obama administration to gin up support for more gun control. Typically, incoming administrations will extend a certain amount of gravitas to the defeated party and not pursue contempt votes or criminal charges. When President Obama took office in 2008 with a Democrat dominated Congress and Senate, he could have easily called former President Bush and Vice President Cheney before a congressional committee on charges of war crimes for lying about weapons of mass destruction and misleading the country into the Iraq war that cost nearly a trillion dollars and cost over 4500 young soldiers their lives. Instead he chose not to pursue criminal charges for the good of the country and for the sake of civility within our union. Republicans in Congress have clearly not extended President Obama the same amount of respect and they have demonstrated that they will use any contrived conspiracy or so called scandal to disgrace the President and his executive staff.